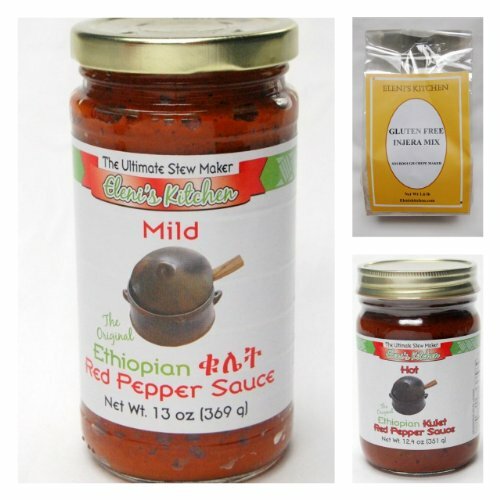 Eleni's Kitchen Kulet - Ethiopian Red Pepper Sauce - Sautéed/Simmered sauce (called Kulet in Ethiopia) prepared from onions, berbere (spiced red chili pepper powder), vegetable oil (canola, soybean), garlic, ginger & other spices. This sauce is the base used to prepare gourmet stews (beef, lentils, chicken, etc). Eleni's Kitchen Kulet (Red Pepper Sauce) is authentically flavored and is made from all natural ingredients. Enjoy the rich exotic aroma and flavors. This injera mix is a mix of 70% whole grain teff flour and other flours. Directions for making the injera is on the label. Please use an electric griddle to make the injeras. A skillet or large pan would also work, but the apperance of the holes on the injera may not be uniform. Yields 6 - 7 regular size Injeras or 10 small injeras, if a pan or skillet is used. Authentic & delicious. Makes a great gift! If you have any questions about this product by Eleni's Kitchen, contact us by completing and submitting the form below. If you are looking for a specif part number, please include it with your message.